Roses are red… violets are blue… I made you cupcakes that I hope you will chew. Sooooo it’s supposedly the most romantic day of the year and stuff and I can’t think of anything more romantic than face planting into a pile of that frosting with the one you love. And since I really love YOU, I had to share something uber romantic. 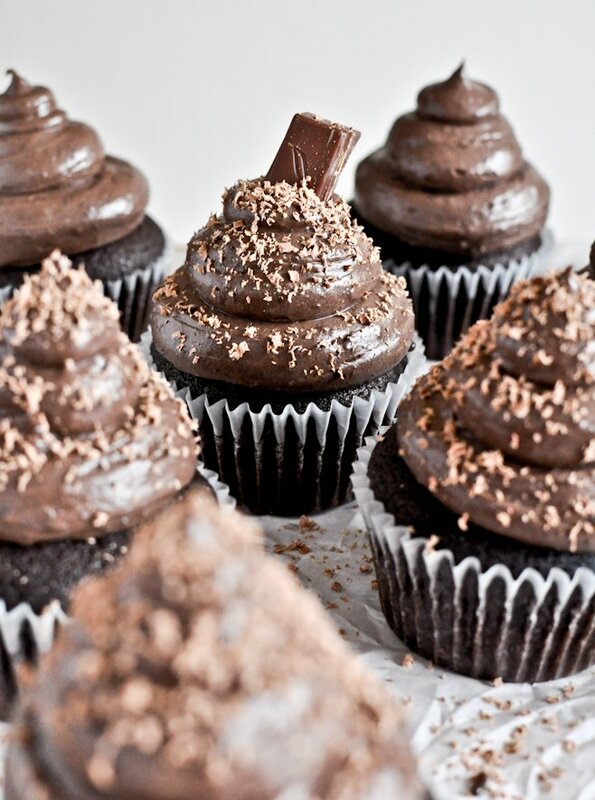 Piles of chocolate frosting for the win. Surprise! You’re my valentine. Isn’t that cool? I mean, technically I already HAVE a valentine but he can be weird and not want to eat chocolate lover’s cupcakes and also spends a fair amount of time hoping to perfect Ric Flair’s shin breaker and carries a tattered picture of Conway Twitty in his wallet. Okay not really, but I swear that is exactly what he’s like in real life. And this is my… real life. Luckily he redeems himself quite often by surprising me with chocolate lava cake truffles. That’s nice. Not sure if you know this, but I’m a chocolate fanatic. No, really. REALLY. I am not exaggerating in the least when I say that I could eat chocolate for every waking moment of my life. I do not wake up craving eggs or oatmeal or waffles or any baloney like that. I wake up wanting chocolate. 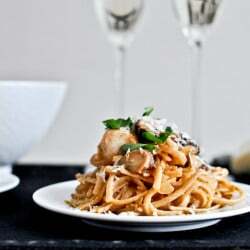 I want truffles for lunch. I want Godiva mousse cheesecake for dinner. And only then, after all that, do I want dessert. GOOD dessert. It’s not the sugar I want… give me cake or candy or ice cream and I’ll easily win that staring contest. It’s the creamy dreamy cocoa. Obviously these cupcakes make my head spin. I wish I could give you five thousand of them every single day for the rest of your life. Because I like you LIKE THAT. In a bowl, whisk egg and sugar until smooth and no lumps remain. Add milk, cream and vanilla, and mix until combined. Stir in sour cream. Sift dry ingredients together and add to wet mixture. Mix until batter is smooth. Add in melted butter and stir until smooth. Fold in chocolate chips. Line a muffin tin with liners and using a 1/4 cup measure, add batter to each cup. Bake for 15-18 minutes. Let cool before frosting. In the bowl of an electric mixer, beat cream cheese until smooth. Add in vanilla. With the mixer on low speed, slowly add powdered sugar 1/2 cup at a time and add cocoa powder, increasing the speed to mix. Add in melted chocolate. If the frosting it a bit too thick, add milk 1 teaspoon at a time until desired consistency is reached. If it is too thin, add additional sugar gradually. Frost cupcakes once cooled. Top with chocolate sprinkles, shaved chocolate, chocolate bars, etc. Note: as you can see I used a TON of frosting on my cupcakes. I had about 1/2 cup of frosting left over, so if you plan to use less frosting (i.e. you are going to spread it on with a spatula or use a tiny blob), then cut this recipe in half. Hey Jessica! Is it possible to use greek yogurt instead of sour cream? Thank you! 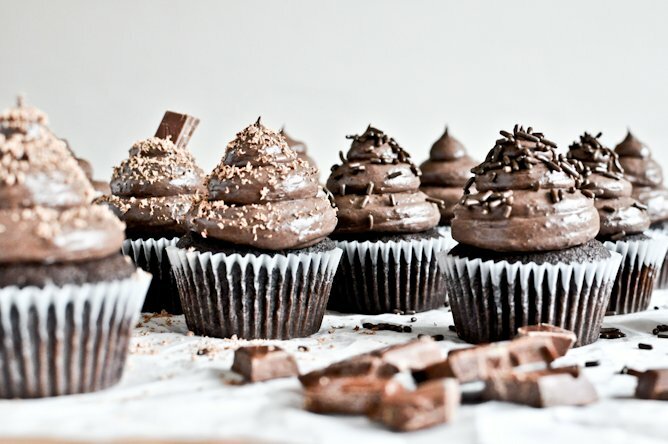 making these tonight for my choco-holic sister’s birthday! These look outstanding!! I have a party that I want to make these for on Sunday afternoon, so do you think that I could bake the cake Friday, then frost them Saturday and they would still be amazing for the next day? Also, I should store them in the fridge right? Thanks!! Not sure what I have done wrong, but my icing tasted odd. I expected a very chocolate taste but instead was a little overwhelmed with a cream cheese taste. I melted more chocolate chips and still can only taste cream cheese. Any suggestions for my next attempt? I have made a batch of these before and it is still my favorite chocolate cake recipe to date! How might the cook time change if I wanted to use this batter for 8″ or 10″ rounds? And would one batch of this be good for one round tin? I’m going to try to make these cupcakes. I’ve never made chocolate cream cheese frosting before. Thanks for the recipe.